Home > Climate Change, Earth	> What’s Causing All This Snow? What’s Causing All This Snow? What I am seeing outside my window in Washington, D.C. right now is not normal. Something is just not right about two blizzards in one week. I don’t think it’s chance or random. I think we’re seeing the effects of global climate change. See the map up top? 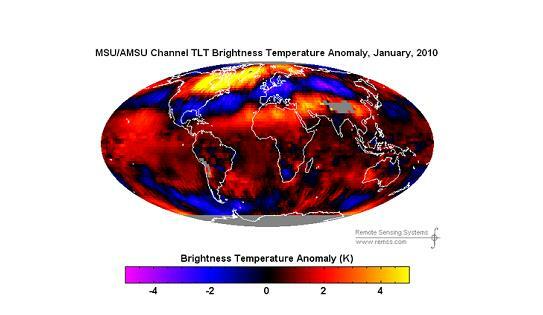 That’s a recent temperature change analysis of the planet that came out two days ago. Accu-weather writes about it here. We are in the swath of the blue that is cooler. The rest of the globe is warming. Check out Canada. Did you know they’re having to truck in snow to Vancouver for the Winter Games that start this week? It is indisputable fact that the ice cover at the North Pole has been significantly reduced. There are satellite photos of it. See here. When the ice melts, where does that moisture go? Into the atmosphere. What feeds storms? Moisture. Global warming does not suddenly repeal the seasons. Winters are still winters. But with more moisture in the air, storms get fed, and I theorize, create things like the unprecedented ferocity and number of blizzards we’re seeing right now. Forget the politics of all this. I don’t know if humans have caused this to happen. This could very well be cyclical. We’ve had dozens of ice ages and warming trends over millions and millions of years. This could be another one of them. I don’t even know if there’s anything we can do about it or, given the current state of the global economy, can even afford to. But as the winds blow at 40 mph and snow drifts of three, four and five feet start building across the mid-Atlantic states; as I see white-out conditions below the Mason-Dixon line and meteorologists beside themselves watching something that’s never been seen in recorded history, it sure makes me wonder what’s really going on. Whether or not these storms are caused by global warming, one of the biggest drawbacks I see is so many people will wish they’d kept their SUVs to drive in this mess. Let’s hope after the snow melts, thousands of people aren’t wanting to trade in their hybrids.